I’m two hours into Persona 3 Portable and I’m thinking about the illusion of control. It’s one of those games that spins its own web for a while. Your main act of participation is to press a button at the end of every line of dialogue—to give the speaker permission to continue. If you don’t press ‘x,’ she stands suspended, with that final word still hovering on her lip. It’s a silly mechanic. After I enter my name, I sit through screen after screen of dialogue. I like the dialogue, actually. It’s endearingly bizarre—just Japanese enough to make the game into a cultural experience. For an hour I have no options—just press ‘x’ to continue, but eventually I’m alone in my room, and I’m ready to do something. The game presents me with a still picture and a cursor. There are several points of interest that I can select, but almost all of them give me the same message: “You’re tired. You should go to bed early tonight.” I’m tired, am I? I open the menu and flip through the options. I notice an interesting choice: Auto Text on/off. It’s set to off by default. I switch it to on. And then, with nothing else to do, I go to sleep. When I wake up, things have changed. The first thing that bothers me is the timing. Characters won’t wait for anything. Once one has finished her lines, the next blurts in. It’s like everyone is itching to speak, eager to make themselves heard. It makes me feel nervous, jumpy. My thumbs hang uselessly above the buttons of the PSP. No input required. It won’t stop; even scene changes are automatic. The game charges ahead, eyes shut, losing its balance. 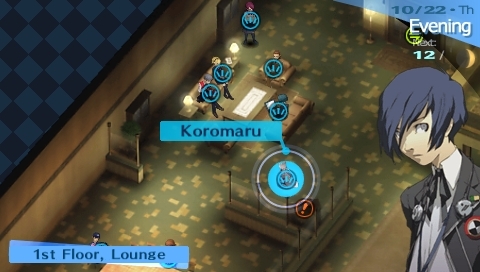 I want to open the menu and change it back, but I can’t, because the menu won’t open during dialogue, and the dialogue won’t stop. My girlfriend asks me to do the dishes. “I can’t,” I tell her, “I have to watch this.” I can’t even pause. I’m bothered that the game would go on without me. That it would just run on its own for thirty minutes. I haven’t pressed a button in so long, how does it even know I’m here? Several years ago, my family went on a trip to Egypt. It was summer, and it was unbearably hot—over 110 degrees. In the temples there was never any shade. The heat was so thick that it undulated in the dry air. In Luxor, we had a blind tour guide. I don’t know what sort of tenacity would lead a blind man to become a tour guide, but there he was, complete with sunglasses, cane and floppy hat. He led us from place to place, tapping his way across the ancient stones, stopping just before he reached the next point of interest. How did he do it—did he memorize the number of steps between monuments? 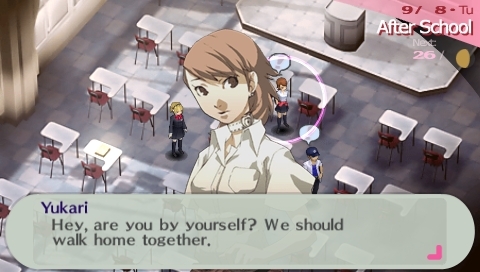 In Persona 3 Portable, I turned auto-dialogue back off at the first opportunity, and our relationship returned to normal. Are you here, asks the blind game, feeling in the darkness? Don’t worry, I’m here.